A few weeks ago I attended a discussion session on how to best support a self-directed child at home (more to come on this important topic in a future post). Interestingly enough, this meeting led to an unintended but meaningful revelation about our home environments and the messages they send to our children. It’s no wonder some of our children are not able function independently in the same manner at home as they do at school. The home environment itself is a barrier to their success. 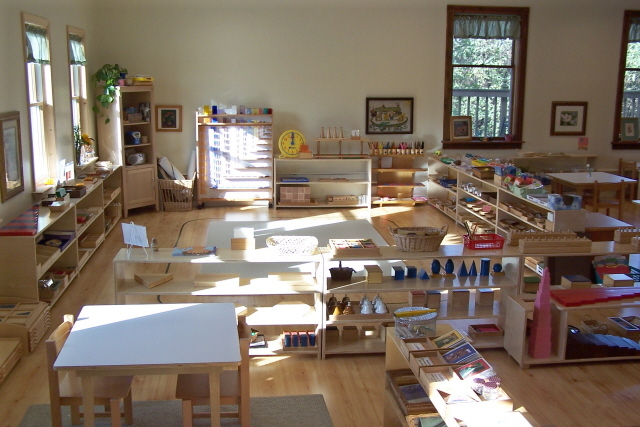 Just like at home, a Montessori classroom has a vast array of items. However, unlike our most of our home environments, in the classroom every object has a purpose, is intentionally lovely, and is thoughtfully organized. 3) only choose those materials that you’ve been given a lesson on. These rules of the classroom set up a system in which children are not fighting over a single material, that the materials are cared for and returned to their proper place, and that children choose activities that are specifically appropriate for each individual. The teachers and assistants also invest a great deal of time checking the materials for missing, broken, or misplaced items, making repairs, and even rotating containers and vessels to create new interest in existing materials. The simplicity, beauty, and calmness of a Montessori classroom is obvious, even to those not familiar with the methodology. The children in a Montessori classroom work calmly and happily without the constant direction or correction from a teacher. This is possible as a result of careful preparation, lovely, age-appropriate materials, and the lessons and rules of classroom etiquette. Montessori’s writings on the Montessori teacher and the Montessori environment can help us to understand why the classroom environment looks the way it does. 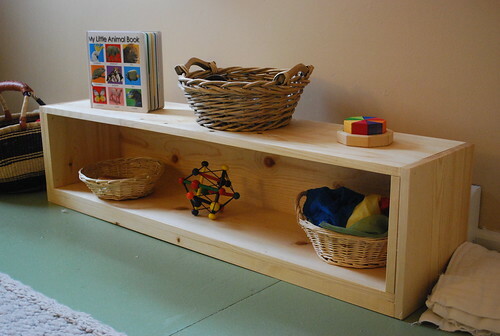 b) make sure that every object used by the children has a place of its own that is easily accessible to them. Thus, the black and coloured pencils, the paper, the pen, the ink, etc., must be placed in such a way that the children can take them in an orderly fashion without the help of the teacher. The order in which the objects are kept teaches order to the children. For many of us, our homes are usually another story. Our living spaces are not often intentionally ‘prepared’. The things we surround ourselves with are not always lovely, not always useful or meaningful. In our house, we have closets and a garage full of things we don’t really need or use. We have living spaces that are cluttered with toys, books, games, art projects and the like. Often these things have missing or broken pieces. We have a variety of things we’ve purchased that we liked in the moment, but now don’t necessarily need. All these things take up physical and mental space for us and for our children. With closets stuffed to the max, garages piled high with boxes and bins, play rooms bursting with toys, it’s nearly impossible to know what you have or where it all goes. Just the thought of organizing it all is stressful. If managing the stuff is a daunting proposition for the adults in the house, imagine what it might feel like for a child. Contrast that to the simplicity and ease of a Montessori classroom. It’s not terribly surprising that in an unorganized and cluttered adult home environment that our children cannot, or do not, behave at home the same way they do at school. By no means am I implying that we should recreate Montessori classrooms full of Montessori materials in our homes. In fact, doing so is highly discouraged. As parents we can be more deliberate about the home environments we create by understanding how and why a Montessori classroom works to support independent activity. My mission for 2013, albeit a challenging one, is to eliminate from our home the things we do not need, do not use, and do not want. I want to make more child-friendly living spaces that enable them to be engaged and self-directed. Ideally, I want our children to manage their own spaces and not be overwhelmed by clutter. Our kids only need a few toys and books at any one time, displayed lovingly, with a clear method of organization that allows them to access them and return them to their proper place without any help. They also need to be taught which things they can use freely and independently, and which things are not age-appropriate. I have to be better about checking my younger child’s toys for missing and broken parts, about rotating books and toys on a regular basis, and about reinventing existing toys to make them new and interesting again. This sounds like a major undertaking at the moment. If we can reduce the quantity, managing and caring for the things we choose to keep will be much simpler for everyone. I don’t intend to get rid of all the toys, books, games, etc in our house. I do not intend to get rid of the toys and replace them with Montessori materials (also highly discouraged). What I will do is be more deliberate about what we really need, what is truly engaging, and what is lovely and pleasing to us. I intend to be more thoughtful in how these things are arranged, displayed and organized. For the kids specifically, they really need to be able to see the toys and books they have available. Those things should be easy for them to access and put away on their own. Montessori classrooms do this beautifully. Each material has a place on a shelf. Nothing is stacked or hidden, nothing is in a toy box or in cluttered bins. The children can see the materials, can access them easily, and can put them away with ease. In our house, we store some toys and books and every three or four weeks we rotate them to spark new interest in older toys. What I haven’t fully considered is the quality of toys and books we make available at any one time, how the quantity effects the beauty and simplicity of our home, how the excess creates a hardship or barrier to access and clean up, and how the quantity is not as important as the quality. Montessori classrooms also place an emphasis on the quality of the materials. Everything is deliberate, organized and well maintained. In “The Power of Conscious Parenting” By Miller/Dunlap, PhD, they write that one of the most important things parents can do at home is to simplify and organize the home and to create spaces for children that are uncluttered. “Toys are the biggest obstacle to order…..One of the most important things to know about buying toys is when not to. We fill our spaces with useful, lovely, and interesting things. We take care of them, repair them, and respect them because they are important to us. You nailed it! I can’t tell you how often I’ve heard a parent ask my why their child doesn’t “do that at home.” The prepared environment is key. I have to say, though, that as teachers, we have lots of opportunities for new beginnings. They come naturally after school breaks, especially the new school year. It’s more difficult to change a pattern of behavior once it is in place. How would you address this issue at home? Create your own new beginnings? Say, the new month? Thank you so much for your comment and insight. Opportunities for new beginnings can happen at any time, this is true. In our home, our children each have a wall calendar. “Turning the page” for a new beginning at the start of a new month makes so much sense and can be easily understood. Great idea! can i ask if you have a dedicated play room? i like this idea in combo with a more “loose” approach but am concerned about my daughter not going to bed/nap because she sees all these toys calling her to play with them. Thanks for your comment Dom! In our house we do have a space dedicated for play that gets a lot of use. The kids’ bedrooms also have open shelving with books and a few toys. Books are such a favorite part of our nap and bedtime routines that the toys haven’t been much of a distraction. Creating a sleeping space that is as peaceful and calming as possible makes a lot of sense! Toys can always be located elsewhere, particularly in a more active space in the home.